Gainford Drama Club”s amateur production of “There Goes The Bride” by Ray Cooney and John Chapman has been entertaining capacity audiences for eight performances. 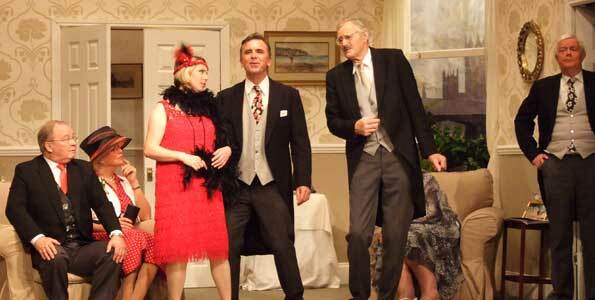 The madcap and hilarious farce had audiences roaring with laughter as confusion and communication mix ups abound when harassed advertising executive Timothy Royston Westerby (Paul Illingworth) hits his head on the morning of his daughter Judys society wedding. He awakes to find himself in the company of Polly Perkins, a 1920s Flapper girl (beautifully played by Claire Bell) straight out of his current advertising campaign, who no one else can see or hear. A member of the departing audience complained that “my jaws are aching with laughing”, confirming the success of Lawrence Chandler”s debut as Director, assisted by Pamela Westgarth. A newcomer to the stage was Imogen Richardson (aged only 14 this month!) who took over the role of the bride only three weeks before dress rehearsal, replacing Claire Bell who bravely took on the challenging role of Polly Perkins after the original actress had to bow out owing to work commitments. 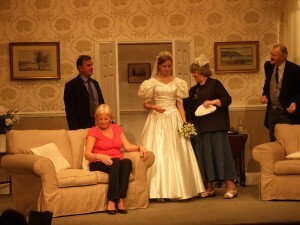 Other members of the cast included popular performers John Robinson and Veronica Lowery playing the bride”s grandparents, Barrington Wearmouth as business partner Bill Shorter, Jean McCann as mother Ursula Westerby and Michael Sillars as the antipodean millionaire-in-law. These five comic parts were played to perfection with John Robinson”s hilarious performance as eccentric grandfather being especially well received.